January 11, 2012—When I saw a smattering of dark purple poop on my front steps this morning, I thought, "Hm, the cedar waxwings are early this year." 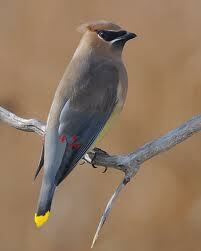 The only time I see cedar waxwings in Suisun City is when the berries on nearby trees are ripe. These beautiful birds with butter-cream breasts and dramatic Zorro-masked eyes, time their visits to feast on the berries, eating and popping from our neighbor's tree that hangs over our front steps. Jan. 25, 2007: A flock of cedar waxwings arrived and are mixing it up with American robins, busy flying in a three-tree triangle. January 15, 2008: Small group of waxwings here eating berries. Low number of birds so far. February 4, 2008: About 70 waxwings in the tree today, tck-tck-tck as the seeds from the berries hit the bricks. February 18, 2009: Two-hundred waxwings arrived today and are feasting in the bare-leaved eucalyptus tree. Only occasional bombs fall, but I can hear a constant tat-tat-tat from the hard seeds hitting the brick steps. Something spooked them as I watched, and as a flock they flew to the pepper tree across the street in a swooping circle, then back to the tree in front. All of them gone the next day. April 14, 2010: Around 50 waxwings came through but missed the ripe berries by several months. March 22, 2011: Around 50 waxwings in the trees at 3:30 p.m. Gone by 5:00 p.m. The berries are mostly gone and they didn't find their usual feast. According to these observations, their migration times vary. They may be a bit earlier than previous years, but only by a few days.